Lock in a great price for Hotel Indigo Shanghai On The Bund – rated 8.5 by recent guests! Room is clean and really comfortable, really nice bathroom with big bathtub and shower. Really comfortable bed with even a pillow menu! Breakfast was good. Rooftop bar has a nice view and good drinks. Nice gym and pool and overall an excellent service! Great location. Great view. Clean and beautiful. Comfortable beds. Originality in the decor. Fantastic views from the River View Room Located right on the water so easy walk to the Bund. Staff is amazing! Excellent English and able to assist in any way needed. There is an incredible assortment of foods at the breakfast buffet as well as the option to order a number of additional cooked to order meals. In my opinion, the set menu breakfasts were less impressive than the abundant buffet. The rooms are funky and stylish with a very comfortable bed and the option of choosing your style of pillow. Rain shower was great with river view as well. Great place on the river, fantastic rooftop bar, and a great steak restaurant. It’s close to a lot of sights. We were able to walk to most. Unique room decoration. Small but very cozy. Great shower. Easy access to river promenade and ship pier. All over excellent boutique hotel. Have stayed at the Indigo in HK and now Shanghai. I will also try NY very soon to compare. The local design to the room and interior was well done and the pool was very nice. Also there were no pay per view movie options which seems to be the standard in most high end hotels. The view was amazing. The breakfast buffet had so many choices. One of our top picks in Shanghai.The stylish Hotel Indigo Shanghai On The Bund is located along the Huangpu River, with spectacular views of Pudong. A 2-minute walk from Shiliupu Marina and Shiliupu Bus Station, it offers welcome drinks upon arrival, an indoor pool and modern air-conditioned rooms with free Wi-Fi. Hotel Indigo Shanghai is just 1,650 feet from The Bund and 1.2 mi from Lujiazui Shopping Area. Pudong International Airport is 25 mi from the hotel. Blending modern décor with traditional Chinese furnishings, the beautiful rooms at Indigo On The Bund are equipped with a 42-inch flat-screen TV, iPod dock and a handy phone. A comfortable seating area, fully stocked mini-bar and luxurious private bathroom are also included. Guests may exercise at the well-equipped fitness center or enjoy quiet moments at the hotel’s library. Hotel Indigo Shanghai also provides laundry services and free parking. Overlooking the river, Char Bar & Grill serves Western cuisine and a premium wine list. A daily buffet breakfast is also available. 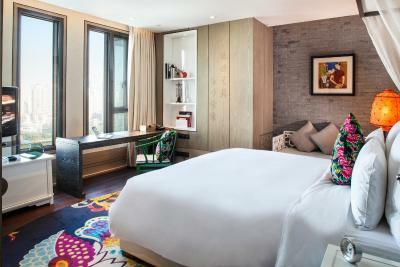 When would you like to stay at Hotel Indigo Shanghai On The Bund? On the 7th to the 28th floors, the room offers side views of Huangpu River. Located on the 7th to the 28th floors, the room has a 42-inch LCD TV and mini-bar. Offers views of The Bund or Lujiazui Financial District. Offering city views, the room features a walk-in closet, 42-inch LCD TV, iPod docking station and sofa. The bathroom includes rain showers. Located on the 7th to the 28th floors, the room has a 42-inch LCD TV, iPod docking station and mini-bar. Room offers views of The Bund or Lujiazhui Financial District. 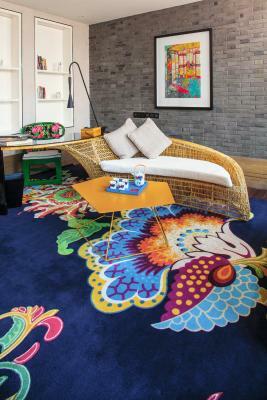 House Rules Hotel Indigo Shanghai On The Bund takes special requests – add in the next step! Greatwall Peony Dragon Pacific Jin Hotel Indigo Shanghai On The Bund accepts these cards and reserves the right to temporarily hold an amount prior to arrival. Hotel Indigo Shanghai On The Bund accepts these cards and reserves the right to temporarily hold an amount prior to arrival. Good location by the river. We found ourselves walking along the Bund at 6pm which is a perfect time to do so. Breakfast was good and the location was lovely. Our room overlooked the river and we found ourselves walking along the Bund at 6pm which is the perfect time to do so. Amazing service, stunning views and the best hotel breakfast I’ve had in shanghai. I will definitely be back! Some may find the rooms to be a little small. It is dark in the hotel. Bar is not serving finger food if you arrive late. Seating the bar is dirty and old. Short time. Wish could have don a late check out. It was a great couple get away. Enjoyed a lovely meal at Char. My husband was in heaven, The chef was so friendly. Then stayed the night. The bed was so comfortable and pillows. My husband was impressed by the details and accents in the room. The breakfast selection didn’t have that much of a variety. The design, the concept. The staffs were friendly and helpful.